LAS VEGAS, Nev. – If you thought last Sunday’s Monster Energy NASCAR Cup Series race at Atlanta was an aberration on old asphalt, think again. 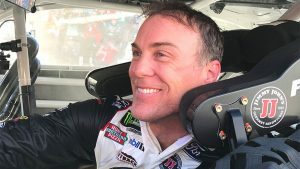 Kevin Harvick was every bit as dominant on the newer asphalt at Las Vegas Motor Speedway, racking up impressive numbers in winning Sunday’s Pennzoil 400, the third event of the season. In winning his second straight race and his second at the 1.5-mile track, Harvick finished 2.906 seconds ahead of runner-up and Las Vegas native Kyle Busch. Third-place finisher Kyle Larson was more than 13 seconds back. Paul Menard in ninth-place was the last driver on the lead lap. Harvick won for the 39th time in the Monster Energy Series and the 100th time over all three of NASCAR’s national touring series combined. He is tied with Tim Flock and Matt Kenseth for 19th on the all-time Cup victory list and third among active drivers. The driver of the No. 4 Stewart-Haas Racing Ford also took the series lead by three points over second-place Joey Logano and four over third-place Ryan Blaney, who started from the pole on Sunday and led one lap—the first. Harvick led 214 of 267 laps, most ever by a Las Vegas winner. His fastest lap was more than .4 seconds better than the quickest circuit posted by anyone else. Harvick won the first two stages of the race with relative ease, picking up two Playoff points in the process. With all that, the outcome wasn’t a foregone conclusion after Harvick lost three spots on pit road under caution at the end of Stage 2. He restarted fourth on Lap 167, fell back to fifth and didn’t regain fourth-place until he passed Chase Elliott on Lap 172. After two more cautions — the first for Jamie McMurray’s brush with the backstretch wall on Lap 176, the second for a hard crash off Turn 4 that eliminated Kurt Busch and Elliott on Lap 183 — Harvick lined up beside eventual seventh-place finisher Logano for a restart on Lap 195 and rocketed into the lead through the first corner. At that point, it was game over. Kyle Busch led laps 225-230 after Harvick made a green-flag pit stop on Lap 225, but that was Busch’s last glimpse of the lead. Harvick reclaimed first place after Busch came to pit road on Lap 230 and stayed there the rest of the way.